Single-celled organisms don’t need blood or a circulatory system to maintain homeostasis because they get nutrients from and excrete wastes directly into their environment. Humans, on the other hand, have trillions of cells and are much larger and more complex than paramecium or bacteria. This requires a more sophisticated system to help maintain homeostasis. The four major parts of the circulatory system are the heart, blood vessels, blood, and lymphatic system. The heart is a pump made of cardiac cells that circulates blood and lymph throughout the body. Its arteries carry oxygen-rich blood and nutrients to the tissues while the veins transport waste products to areas such as the lungs for elimination. The parasympathetic and sympathetic nervous systems control heart rate. Through these systems, the body reacts to its internal and external environments to change the heart rate and maintain homeostasis. For example, when a person starts to exercise, the body stops parasympathetic stimulation of the heart so the rate can gradually increase, bringing more oxygen and nutrients to the muscles. Then, as the exercise gets more strenuous, the sympathetic system begins sending signals to the heart to raise the rate even more. At the same time, the increased amount of waste products coming from cells are transported out of the body at a faster rate, maintaining homeostasis. 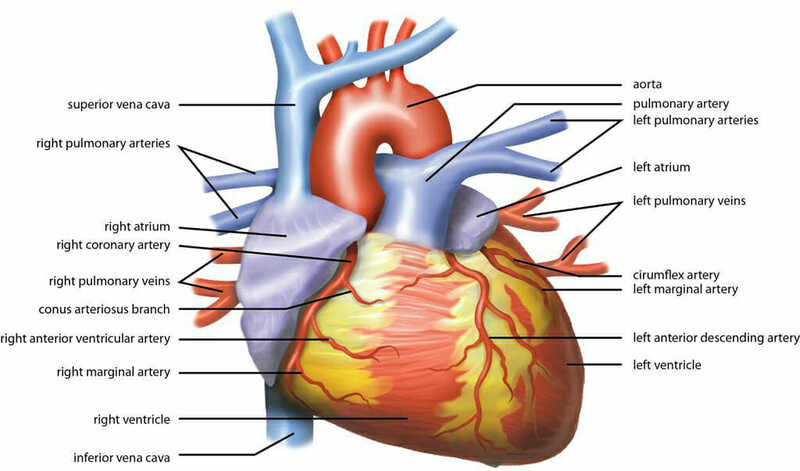 The image above shows the human heart and its chambers and vessels. Blood vessels such as arteries, veins, and capillaries can dilate and constrict to help the body maintain homeostasis. When sensors in the body detect an increase in core temperature, vessels dilate to allow more blood to pass through them which releases the excess heat. Vessels constrict when the core temperature drops, and this restricts blood flow and conserves heat. In addition, vessels contain baroreceptors that respond to the stretching of the vessel walls caused by the blood. The receptors send signals to cardiovascular centers in the brain which regulate blood pressure. 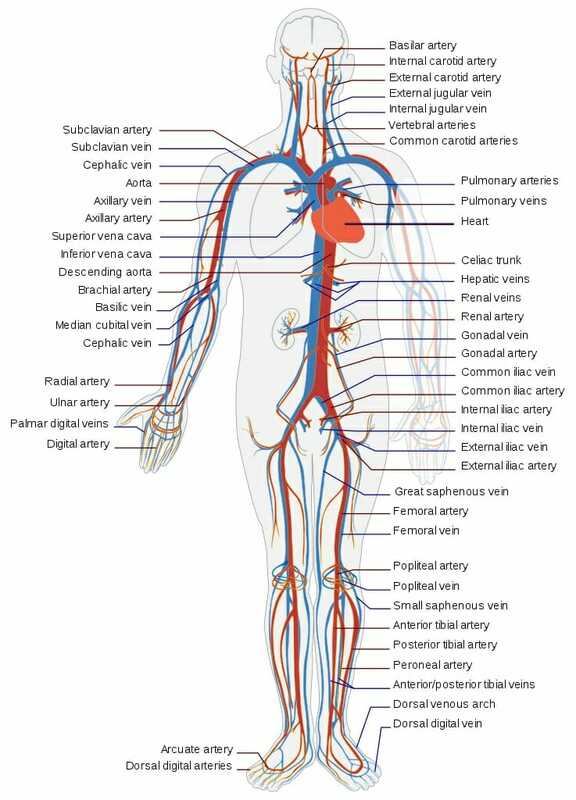 The image above shows the main vessels of the human circulatory system. The components of blood are plasma, red blood cells, white blood cells, and platelets. Some homeostatic functions of blood are the transport of nutrients and wastes, defending the body against invaders, and distributing heat to regulate body temperature. The cells and other components of the blood are constantly on guard for and responding to invaders and taking care of injured and infected tissues. Without these safeguards in place, the body would bleed to death and/or succumb to infections that could be fatal. Plasma surrounds blood cells and serves as its connective tissue. It contains additional components essential for homeostasis including proteins, glucose, and hormones. Proteins, for example, act as buffers to help regulate the pH of body tissues. 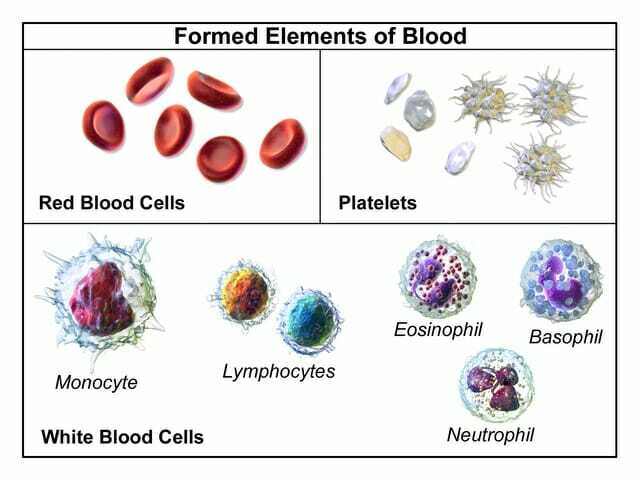 The image above shows the formed elements of the blood. Lymph is the excess fluid in the body that circulates slowly throughout the tissues. It is part of the lymphatic system which is intimately tied to the immune system. Lymph is collected into lymph capillaries and then moved to larger lymph vessels and then into the lymph nodes. Here, lymphocytes gather to clean and filter the lymph and it is then returned to the circulation. The thymus and spleen are the organs of the lymphatic system. The thymus is where T cells mature which are essential for the adaptive immunity of the body. The spleen removes old red blood cells from circulation, acts as a lymph filter and synthesizes antibodies. 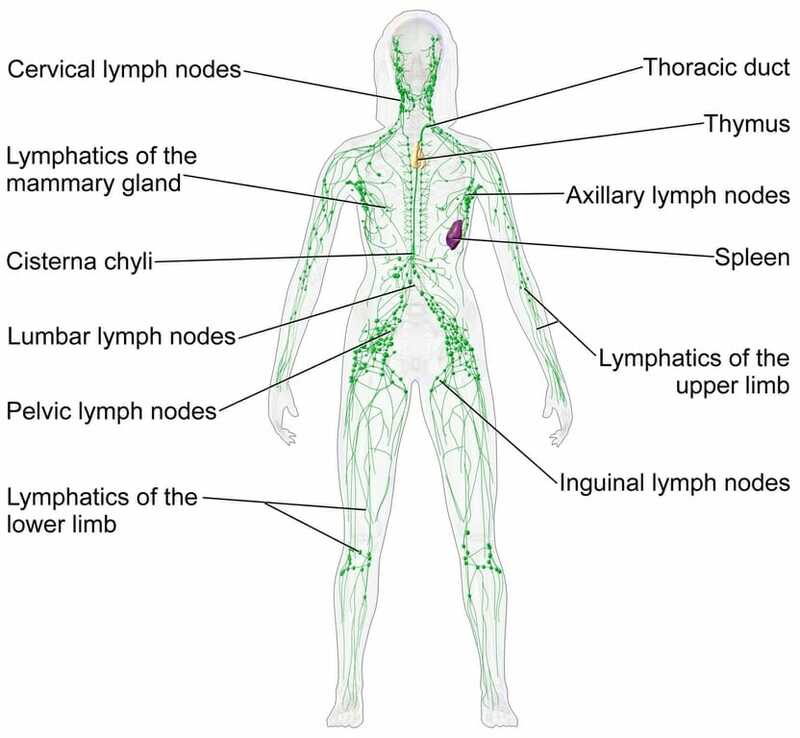 The image above shows the lymphatic system of the human female.